International SEO is all about scalability and high authority. There are a lot of opportunities most businesses miss out on. SEO doesn’t have to be harder for international businesses, it needs to be smarter, scalable, and you should use the power of your brand to increase authority. This article is directed to sites and businesses that are globally active, but some of these points can also be applied to businesses who are only active in a couple of countries. The biggest aim here is to optimize a site with minimal effort on the site itself. Often, the bigger the business, the harder it gets to change something on the site and the harder it is to make big sitewide changes. Therefore, hopefully these points will impact as little as possible on the site itself. Universities are often high authority websites. They provide tremendous link authority when linking to your site. The only problem is often to find a good way to get those links, and to get a lot of them. As an international brand you’ll be able to get dozens of these backlinks quite easily. You don’t even have to do a lot of extra work to get them. Your brand is reputable, a lot of people would love to work there. 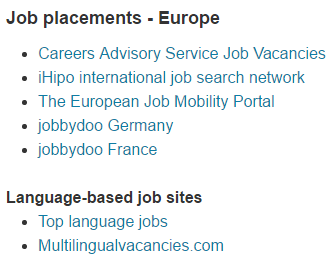 Make sure to have an English version of your careers page. Maybe even English translations of your vacancies. International students might be very well interested in taking a job or internship at your company. They’re currently in school and might be looking for international opportunities. This is where you come in. Look for careers-pages on university sites and see if they might link to your international careers page. Shoot them an email explaining that you’re specifically looking for the type of students of that particular degree or school who are looking for a job or internship abroad. And send them the link to the careers page. As you can see this can be applied worldwide, even if your main office is in Amsterdam for example. How to find these international university backlinks? Or try “Universiteit” instead of universities to get dutch universities. And try other languages of course. Make sure your careers section is on the main .com domain. Not on a subdomain. This way the linkpower will flow to the entire domain, and not just the subdomain. Make sure to point internal links to your main commercial pages. If it’s a vacancy as a brand marketer for the car sales department. You can link to the actual cars for sale on the site. This will help redistribute the linkpower to the commercial pages of your site. This should be best practice for all of your vacancies. The links that you attract with this method will benefit the entire domain, including the commercial pages, as the careers page sits on a subfolder and not a subdomain. When a vacancy is filled, please either keep the page up for the next time when you need a similar candidate, or redirect it to the category the vacancy is in. Always use a 301 redirect.